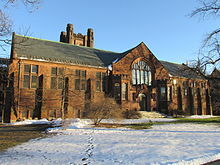 Mount Holyoke College is a private women's liberal arts college in South Hadley, Massachusetts, United States. It is the oldest institution within the Seven Sisters schools, an alliance of East Coast liberal arts colleges that was originally founded to provide women with education equivalent to that provided for men in the then men-only Ivy League. Mount Holyoke also served as a model for other women's colleges and is part of the region's Five College Consortium, along with Amherst College, Smith College, Hampshire College, and the University of Massachusetts Amherst. The school was founded in 1837 by Mary Lyon as Mount Holyoke Female Seminary. Mount Holyoke received its collegiate charter in 1888 as Mount Holyoke Seminary and College and became Mount Holyoke College in 1893. Mount Holyoke's buildings were designed between 1896 and 1960. It has a Donald Ross-designed 18-hole golf course, The Orchards, which hosted the U.S. Women's Open in 2004. U.S. News & World Report lists Mount Holyoke as the 30th-best liberal arts college in the United States in its 2019 rankings. In 2011–2012, Mount Holyoke was one of the nation's top producers of Fulbright Scholars, ranking fourth among bachelor's institutions according to The Chronicle of Higher Education. Mount Holyoke's founder, Mary Lyon, is considered to have been an innovator in women's education. Mount Holyoke Female Seminary was one of several institutions of higher education for young women established during the first half of the 19th century. Lyon's contemporaries include Sarah Pierce (Litchfield Female Academy, 1792); Catharine Beecher (Hartford Female Seminary, 1823); Zilpah P. Grant Banister (Ipswich Female Seminary, 1828); and George Washington Doane (St. Mary's Hall, 1837 now called Doane Academy). Prior to founding Mount Holyoke, Lyon contributed to the development of both Hartford Female Seminary and Ipswich Female Seminary. She was also involved in the creation of Wheaton Female Seminary (now Wheaton College) in 1834. Mount Holyoke Female Seminary was chartered as a teaching seminary in 1836 and opened its doors to students on 8 November 1837. Both Vassar College and Wellesley College were patterned after Mount Holyoke. From its founding, Mount Holyoke Female Seminary "had no religious affiliation". However, "students were required to attend church services, chapel talks, prayer meetings, and Bible study groups. Twice a day teachers and students spent time in private devotions. Every dorm room had two large lighted closets to give roommates privacy during their devotions". Mount Holyoke Female Seminary was the sister school to Andover Seminary. Some Andover graduates looked to marry students from the Mount Holyoke Female Seminary before becoming missionaries because the American Board of Commissioners for Foreign Missions (ABCFM) required its missionaries to be married before starting their missions. By 1859 there were more than 60 missionary alumnae; by 1887 the school's alumnae comprised one fifth of all female American missionaries for the ABCFM; and by the end of the century, 248 of its alumnae had entered the mission field. The change in admission from Seminary to College included fundraising by the Trustees, an overhaul of the entrance requirements, and course catalogue. Entrance exams were introduced at this time, scheduled in June or September at the college. In 1889, students traveling from the midwest could take these examinations in Freeport, Illinois, and within a few years, this was expanded to other cities. Many additions were made to the course catalog, and starting in the 1889 academic year, students could choose to pursue degrees of Bachelor of Arts or Bachelor of Science. Mount Holyoke Female Seminary received its collegiate charter in 1888, becoming Mount Holyoke Seminary and College. Within 4 years, the seminary enrollment dropped from 269 to 122 to 8. In 1893, the seminary course was discontinued, and the new title Mount Holyoke College was authorized. A movement towards what was referred to as cottage-style living started in 1889 by the New York Association after the change to Mount Holyoke Seminary and College. $15,000 was raised, and plans were put in place for Mary Brigham Cottage, with accommodations for the president and thirty students, with priority given to those in the collegiate course. At the time, two South Hadley families agreed to host boarders, and some students were permitted to live at the hotel. President Elizabeth Mead deemed both of these options unsatisfactory, and pushed the Trustees to build yet another cottage. Mrs. Mead was ready to relieve the students of a large share of the drudgery of domestic work that had made up a good portion of their studies since Mary Lyon's conception of the seminary. From 1895 to 1996 the trustees allotted funds for the employment of four women to wash the dinner dishes that had formerly constituted the task of eight or ten students. The Mount Holyoke chapter of Phi Beta Kappa was established in 1905. It has been a sister school to Women's Christian College in Chennai, Tamil Nadu, India since 1920. In the early 1970s Mount Holyoke had a long debate under the presidency of David Truman over the issue of coeducation. On 6 November 1971 the board of trustees voted to remain a women's college. At Convocation on September 2, 2014, President Lynn Pasquerella announced a new policy allowing the admission of transgender individuals to the college, as well as the admission of students whose gender identities are non-binary. Mount Holyoke’s membership in the Five College Consortium allows students to enroll in courses at nearby Amherst College, Smith College, Hampshire College, and the University of Massachusetts Amherst. They may also complete one of 12 Five College Certificates—among them African studies, Buddhist studies, coastal and marine sciences, cognitive neuroscience, international relations, and Middle Eastern studies—in lieu of a minor. Mount Holyoke College attracts ambitious, independent women from around the world who embrace complexity, cultivate curiosity, and resolve to become agents of change. The tight-knit community is academically rigorous, intellectually adventurous, and socially conscious.The 2019 annual ranking of U.S. News & World Report categorizes Mount Holyoke as "'more selective". For the Class of 2023 (enrolling fall 2019), Mount Holyoke received 3,956 applications and accepted (36%) of applicants with a intended enrollment of 525 students. The median of SAT scores was 1410 overall, while the median for the ACT composite score was 32. Eighty percent of the accepted students are projected to be in the top 20% of their graduating high school classes. U.S. News & World Report's 2019 rankings ranked Mount Holyoke the 30th-best liberal arts college in the nation, and tied for 33rd for "Best Undergraduate Teaching". In 2018, Forbes rated Mount Holyoke 128th overall in its America's Top Colleges ranking, which includes 660 military academies, national universities, and liberal arts colleges. Kiplinger's Personal Finance places the school 39th in its 2016 ranking of best-value liberal arts colleges in the United States. Three academic centers—the Weissman Center for Leadership, the McCulloch Center for Global Initiatives, the Miller Worley Center for the Environment—support the academic program through public lectures by visiting scholars, conferences on issues of pressing concern, mentoring and internship opportunities, and hands-on learning experiences. The Weissman Center’s Speaking, Arguing, and Writing (SAW) Program provides opportunities for developing leadership and communication skills, including the ability to effectively frame, articulate, and advocate positions. The Community-Based Learning Program links students with community-based organizations in courses that combine analysis and action. Mount Holyoke has study abroad programs and exchanges for full-year or semester study in France, Senegal, Costa Rica, Chile, Hong Kong, Japan, Korea, Germany, Spain, and the UK, as well as a summer program in China and January Term programs in the Republic of Georgia and South Africa. The College is also affiliated with more than 150 study abroad programs in more than 50 colleges and students have the opportunity to petition any programs with which the College is not already affiliated. The College also encourages international internships and research for semester, year, summer or January terms. Each year more than 200 Mount Holyoke students, representing approximately 40 percent of the junior class, study for a semester or academic year at universities and programs abroad. Through the school’s membership in the Twelve College Exchange Program, Mount Holyoke women can study at one of 11 other schools, including Dartmouth College and Vassar College, for one or two semesters. Mount Holyoke’s library includes more than 740,000 print volumes, 1,600 periodicals, and more than 140,000 electronic resources. Through the Five College Consortium, students have access to more than 9 million volumes. Computer support is provided. The MEWS (Mediated Educational Work Space) supports collaborative multimedia learning with group project rooms, wall-mounted plasma displays, a digitization center, and a faculty development area. In 2013, "Clear and Gold Tower," a glass sculpture by Dale Chihuly, was installed in the Williston Library's atrium. The 800-acre (3.2 km2) campus was designed and landscaped between 1896 and 1922 by the landscape architecture firm of Olmsted and Sons. The campus includes a botanic garden, two lakes, several waterfalls, tennis courts, stables and woodland riding trails. It is also home to the Mount Holyoke College Art Museum which is part of the Five College Museums/Historic Deerfield and the Museums10. An independent bookstore, The Odyssey Bookshop, is located directly across from the campus in the college-owned Village Commons. Mount Holyoke has instituted “The Big Turn Off” energy conservation campaign. It also focuses on "green" building with five LEED certified buildings on campus. It has reduced its environmental impact by recycling 40% of waste and composting as well as using produce grown in the student-run organic garden in dining halls. The Seminary Building (1837) contained classrooms, parlors and rooms for students and faculty, the original library, and a periodical reading room. A south wing was added in 1841, a north wing in 1853, a gymnasium and laundry in 1865. All were destroyed by fire in 1896. Upon the burning of the college building in September of 1896, Treasurer Williston announced the pressing need for a new chapel building, a new gymnasium, and a series of cottage dormitories in the modern style. This style of separated buildings allowed for a flexibility of fundraising that was attractive to the Trustees, while still providing the students with the resources and accommodations they needed. In 1897, Mary Lyon Hall and Mary Lyon Chapel were built, as well as dormitories Brigham, Safford, Porter, and Pearsons. Blanchard Gymnasium was completed in 1899. 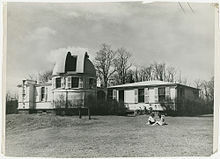 John Payson Williston Observatory (1881) was given in memory of the Willistons' eldest son and built to be ready for the rare transit of Venus in 1882. It is the oldest academic building on campus. The school's iconic entrance, the Fidelia Nash Field gate, was dedicated in 1912. It was a gift of its namesake's children Helen Field James and Joseph Nash Field. Their brother Marshall Field had died in 1906. The home of Benjamin Ruggles Woodbridge, known as "The Sycamores", served as a dormitory for the college from 1915 to 1970. 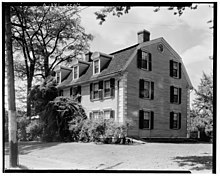 The mansion, built in 1788 by Colonel Woodbridge, is on the National Register of Historic Places. The college has 21 residence halls as well as apartments and "annex" spaces in which to house students, and an overwhelming majority of students live on campus (98%). Each residence hall reserves a quarter of its rooms for housing first-year students with the exception of Pearsons Annex, which is reserved for living learning communities, and Dickinson House, which is reserved for Frances Perkins Scholars. Most residence halls house students from all four class years at any given time. Six of the residence halls have full dining halls, though have been decommissioned, and new plans for repurposing are pending. Residence halls have a variety of architectural styles and ages. Mount Holyoke College switched to centralized dining in Spring 2018 when they opened the Dining Commons, an addition to Blanchard Hall. 1837 Hall was constructed in 1962, and is named for the year the original Mount Holyoke Seminary was founded. :54–57 1837 houses 157 students in single, double, and triple rooms; and has a full kitchen and student lounge. Abbey Hall was funded by Emily Abbey, the same benefactor who paid for a renovation of Abbey Chapel in 1937. Abbey Hall was completed in 1939. Abbey Hall is a three story building that houses 89 students. Architect Douglas Orr designed the building in a Georgian style. A special feature of life in Abbey is the third floor, where students agree to a 24-hour quiet space. Brigham Hall was built in 1897, the same year as Safford and Porter. It was the first building to be completed after a fire devastated the campus in 1896. Brigham is named for Mary Brigham, who had been expected to become President of the College in 1889, but was killed in a train accident before she could assume the office. Brigham has a capacity of 85 students. Dickinson House was originally built as a faculty dormitory in 1916. It is named for Emma Dickinson, class of 1867. Renovated in 2001, this dormitory formerly housed Frances Perkins scholars, but currently is open to all students. The complex now commonly referred to as "the Mandelles" or "the Delles" was originally known as Hillside, after it was constructed in 1923. North Mandelle Hall has four floors with space for 113 students, and South Mandelle Hall has four floors with space for 90 students. As of Fall 2017, the Mandelles house the college's Language Living Learning Communities. Pearsons Annex houses a small number of students, and over the years has been used as a home for Frances Perkins Scholars as well as several living learning communities. It was originally purchased by the College to use as housing for first year students. Porter Hall has three floors and a basement, and houses 97 students as well as the Sociology and Anthropology department offices. Prospect houses 143 students on five floors, and is home to the newly renovated Maker Space. The building was built in 1959. A domesticated goose commonly known as Jorge sometimes begs for food from the students who sit at outdoor tables to eat. Torrey Hall was known as Lakeside when it was built during 1948 and 1949, and was later renamed for Louise [Torrey] Taft, who was a member of the class of 1845 and who was the mother of William Howard Taft. Lakeside was designed by architect Douglas Orr, who had designed Emily Abbey Hall. Torrey houses 126 students on four floors and a mezzanine. Wilder was built in 1899 in memory of Mary Ware Wilder, by her husband Charles Wilder. It houses 101 students. 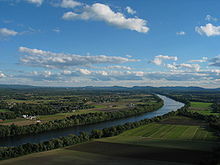 Mount Holyoke is a member of the Pioneer Valley's Five College Consortium, the Consortium of Liberal Arts Colleges, the Annapolis Group, the Oberlin Group, and the Consortium on Financing Higher Education. WMHC (91.5 FM) is a radio station licensed to serve South Hadley, Massachusetts. The station is owned by Mount Holyoke College is one of the oldest stations run by women. Mount Holyoke has a student population of 2,300. Students come from 48 states and nearly 70 countries. Two thirds of the student body are White; one third are international students, African American, Asian American, Latina, Native American, or multiracial. Thirty-six percent of incoming first-year students were in the top five percent of their high school classes". Mount Holyoke also attracts a large international population. Students may enroll in classes at Amherst, Hampshire, and Smith Colleges as well as the University of Massachusetts, Amherst through the Five College Consortium. The Kathryn Irene Glascock Awards grants The Glascock Prize to the winner of this annual event (which has been held at Mount Holyoke since 1924). The Faculty Show takes place once every four years, around 1 April; faculty members create a show which parodies themselves and their students. Holiday Vespers is an annual Christmas concert that has been held each year since 1899. In addition to the free performance held on campus in Abbey Chapel, each year the students perform in either Boston or New York City. M&C's, originally called Milk & Crackers, is now referred to as Milk & Cookies. M&Cs are a nightly snack provided by dormitory dining halls, but also refer to a student a cappella group, M&Cs (Milk and Cookies). Big/Little Sibling is a reference to the pairing of juniors and "firsties" (or first-years) who are paired up to take part in organized events together. Coordinated by the junior class board. Elfing is a tradition shared between sophomores and first-years. Secret sophomore "elves" leave presents and treats for their first-years throughout the week-long event. On the final day, the first-years get to meet their elves in person at a special M&Cs. The Laurel Parade takes place the day before commencement. Graduating seniors wear white and carry laurel garlands, in a parade to Mary Lyon's grave. They are escorted by approximately 3,000 alumnae, also in white, who thereby welcome them into the Alumnae Association. Once at Mary Lyon's grave, the garland is wound around the cast-iron fence, and the Mimi Fariña song "Bread and Roses" is sung by all in attendance. White is a tribute to those who fought for women's suffrage. In 1970 students voted to replace the laurel with signs protesting the Vietnam War. Mount Holyoke offers 14 varsity sports programs and seven competitive club sports teams. The College is a member of the National Collegiate Athletic Association (NCAA) Division III and the New England Women's and Men's Athletic Conference (NEWMAC) as well as the New England Rowing Conference (NERC). Facilities include a lighted synthetic multipurpose turf field surrounded by an eight-lane track with a nine-lane straightaway; Kendall Sports and Dance Complex housing a swimming pool and separate diving well; gymnasium with basketball, volleyball, and badminton courts; weight room; cardiovascular area; one-acre (4,000 m2) field house with indoor track and tennis courts; squash courts; racquetball courts; and three studios for dance, aerobics, yoga, and other activities; The Orchards, an 18-hole golf course (home to the 2004 U.S. Women's Open) designed by Donald Ross; and a 60-stall equestrian center with two indoor arenas (100' × 256' and 70' × 130'), an outdoor show ring, permanent fibar dressage arena, outdoor cross-country courses, and a boathouse finished for Spring 2010. Wendy Wasserstein's 1977 play, Uncommon Women and Others, is based upon Wasserstein's experiences at Mount Holyoke of the early 1970s. The play explores the lives of the fictional characters Carter, Holly, Kate, Leilah, Rita, Muffet, Samantha, and Susie. Dirty Dancing (1987), which is set at a summer resort in the Catskills in the summer of 1963. The protagonist, Frances "Baby" Houseman (named after Mount Holyoke graduate Frances Perkins), plans to attend Mount Holyoke in the fall to study economics of underdeveloped countries and then later to enter the Peace Corps. The film is screened annually for prospective first-year students. National Lampoon's Animal House (1978), which is set in 1962. It satirizes a common practice up until the mid-1970s, when women attending Seven Sister colleges were connected with, or to, students at Ivy League schools. In the film, fraternity brothers from Delta house of the fictional Faber College (based on Dartmouth College) take a road trip to the fictional Emily Dickinson College (Mount Holyoke College). In "I'm Spelling as Fast as I Can," the Seven Sisters colleges, including Mount Holyoke, appear to Lisa Simpson in a dream when she is faced with the dilemma of throwing away a spelling bee for a full-ride at one of the colleges (and a hot plate). In "Gone Abie Gone," Lisa Simpson is shown wearing a Mount Holyoke sweater while playing online poker to build her college fund. The character Helen Bishop attended Mount Holyoke and spent time studying abroad in France. Bethany Van Nuys, with whom Roger Sterling sets Don Draper up, was a member of the Mount Holyoke gymnastics team. ^ a b c d "Common Data Set 2015-2016" (PDF). Mount Holyoke College. Archived (PDF) from the original on 2016-02-04. Retrieved 2016-02-03. ^ Schick, Martha. "Seven Sisters: then and now - The Boston Globe". BostonGlobe.com. Retrieved 2018-12-09. ^ Shefter, David. "Location Ideal For 2004 Women's Open: Championship Course Was Built For A Woman, Owned By All-Female College". uswomensopen.com. Archived from the original on 2006-04-14. Retrieved 2006-09-01. ^ a b "Mount Holyoke College - Profile, Rankings and Data". U.S. News & World Report. Retrieved 10 December 2018. ^ "Top Producers of U.S. Fulbright Students by Type of Institution, 2011–12". Chronicle of Higher Education. 23 October 2011. Archived from the original on 2011-10-25. Retrieved 14 March 2018. ^ a b Alma Mater: Design and Experience in the Women's Colleges from Their ... – Helen Lefkowitz Horowitz – Google Boeken. Books.google.com. Retrieved 2012-07-14. ^ First Charter of Mount Holyoke. Books.google.com. 2007-01-05. Retrieved 2011-02-20. ^ Jennifer L. Crispen. "Seven Sisters and a Country Cousin". sbc.edu. Archived from the original on 2007-08-18. Retrieved 2007-07-14. ^ "Daily Life at Mount Holyoke". mtholyoke.edu. Archived from the original on January 13, 2010. Retrieved 2006-09-01. ^ "Did You Know?". Christian History & Biography. 90: 3–4. Spring 2006. ^ a b c d Cole, Arthur C. (1940). A Hundred Years of Mount Holyoke College. New Haven, USA: Yale University Press. p. 219. ^ "Mount Holyoke: A Detailed History". mtholyoke.edu. Archived from the original on 2007-09-26. ^ AP (1986-12-21). "Stamp for Holyoke Founder". New York Times. Retrieved 2011-02-20. ^ "The Mary Lyon Stamp". mtholyoke.edu. Archived from the original on 2006-02-19. Retrieved 2006-09-01. ^ "Admission of Transgender Students". Mount Holyoke College. Archived from the original on 2015-01-16. Retrieved 2015-01-25. ^ "Degrees and Requirements | Mount Holyoke College". Mtholyoke.edu. Archived from the original on 2010-08-11. Retrieved 2012-07-14. ^ Master of Arts in Teaching (M.A.T.) | Mount Holyoke College Archived 2013-02-22 at the Wayback Machine. Mtholyoke.edu. Retrieved on 2013-09-07. ^ Master of Arts in Mathematics Teaching Archived 2013-10-21 at the Wayback Machine. Mathleadership.org (2012-05-14). Retrieved on 2013-09-07. ^ Master of Arts in Psychology | Mount Holyoke College Archived 2013-02-23 at the Wayback Machine. Mtholyoke.edu. Retrieved on 2013-09-07. ^ "Dual-Degree Engineering Options". Mount Holyoke College. Archived from the original on 2012-10-13. Retrieved 2012-07-14. ^ "Frances Perkins Program". Mount Holyoke College. Archived from the original on 2010-01-15. Retrieved 2012-07-14. ^ "Postbaccalaureate Pre-Medical Program". Mount Holyoke College. Archived from the original on 2012-01-29. Retrieved 2012-07-14. ^ "Five College Consortium". www.fivecolleges.edu. 2012-06-22. Archived from the original on 2012-07-16. Retrieved 2012-07-14. ^ a b "Mount Holyoke College". ^ a b c "Class of 2023". Mount Holyoke College. 3 April 2019. ^ "U.S. News Best Colleges Rankings: Mount Holyoke". U.S. News & World Report. 2016. Archived from the original on 2017-02-27. Retrieved February 19, 2016. ^ "Kiplinger's Best College Values: College Rankings, 2016". Kiplinger's Personal Finance. December 2015. Archived from the original on 2016-03-04. Retrieved 2016-02-20. ^ "McCulloch Center for Global Initiatives | Mount Holyoke College". Mtholyoke.edu. Archived from the original on 2010-01-19. Retrieved 2012-07-14. ^ "Library | Mount Holyoke College". Mtholyoke.edu. Archived from the original on 2010-10-01. Retrieved 2012-07-14. ^ "Computers and Technology | Mount Holyoke College". Mtholyoke.edu. Archived from the original on 2010-05-28. Retrieved 2012-07-14. ^ Weir, Emily Harrison, Chihuly Sculpture Debuts at MHC | Mount Holyoke College Archived 2013-12-17 at the Wayback Machine. Mtholyoke.edu (2013-08-23). Retrieved on 2014-04-12. ^ Mummert, Roger (2007-11-16). "In the Valley of the Literate". The New York Times. Nytimes.com. Archived from the original on 2012-01-18. Retrieved 2011-02-20. ^ "Mount Holyoke College :: News :: MHC's New Energy Conservation Campaign". Mtholyoke.edu. 2006-11-13. Archived from the original on 2011-06-06. Retrieved 2011-02-20. ^ "Env Responsible Building :: Environmental Stewardship :: Mount Holyoke College". Mtholyoke.edu. Archived from the original on 2011-01-08. Retrieved 2011-02-20. ^ "Amherst College – Green Report Card 2009". Greenreportcard.org. 2007-06-30. Archived from the original on 2010-12-15. Retrieved 2011-02-20. ^ "The Great Fire of 1896: Mount Holyoke Women Remain Calm and Courageous". www.mtholyoke.edu. Archived from the original on 2018-01-02. Retrieved 2018-01-29. ^ MHC Advancement (February 3, 2015). "Building Community Fact #3: Blanchard Campus Center". The Gates. Retrieved April 16, 2018. ^ "Williston Observatory". Mount Holyoke College. 2017-08-29. Archived from the original on 2018-02-20. Retrieved 2018-01-29. ^ "Historic House to be Moved October 19". Mtholyoke.edu. 2004-10-15. Archived from the original on 2011-06-07. Retrieved 2011-02-20. ^ "Mount Holyoke College Archives and Special Collections". Mtholyoke.edu. Archived from the original on 2011-06-07. Retrieved 2011-02-20. ^ "Residence Halls". Archived from the original on 2013-12-03. Retrieved 8 March 2013. ^ "Residence Halls". Archived from the original on 2013-08-02. Retrieved 8 March 2013. ^ a b "Residence Hall Descriptions". Archived from the original on 2018-01-20. Retrieved 30 January 2018. ^ "Dining". Archived from the original on 2013-12-03. Retrieved 8 March 2013. ^ "Dining Halls". Archived from the original on 2013-12-31. Retrieved 8 March 2013. ^ "Board Plan Dining Options". Archived from the original on 2013-12-04. Retrieved 8 March 2013. ^ a b c Lewis, Jennifer (2005). Mount Holyoke College College Prowler Off the Record. College Prowler, Inc.
^ a b c Horowitz, Helen L. (1985). Alma Mater: Design and Experience in the Women's Colleges from Their Nineteenth-century Beginnings to the 1930s. University of Massachusetts Press. p. 306. ISBN 0870238698. ^ "Abbey Hall". Archived from the original on 2014-01-10. Retrieved 30 July 2013. ^ "Brigham Hall". Archived from the original on 2014-01-10. Retrieved 30 July 2013. ^ "Creighton Hall". Archived from the original on 2014-01-10. Retrieved 30 July 2013. ^ "President Honored with Naming of Creighton Hall". Archived from the original on 2013-08-16. Retrieved 30 July 2013. ^ "Ham Hall". Archived from the original on 2014-01-10. Retrieved 30 July 2013. ^ "MacGregor". Archived from the original on 2014-01-10. Retrieved 30 July 2013. ^ "Mandelle Hall". Archived from the original on 2015-06-03. Retrieved 30 September 2013. ^ "Mead Hall". Archived from the original on 2014-01-10. Retrieved 30 September 2013. ^ "Pearsons Hall". Archived from the original on 2014-01-10. Retrieved 30 September 2013. ^ Marden, Parker. "D.K. Pearsons and Beloit College". Archived from the original on 2014-01-10. Retrieved 30 September 2013. ^ "Pearsons Annex". Archived from the original on 2014-01-10. Retrieved 30 September 2013. ^ "Porter Hall". Archived from the original on 2014-01-10. Retrieved 30 September 2013. ^ "Jorge Eats Lunch". Archived from the original on 2014-01-10. Retrieved 30 September 2013. ^ "Rockefeller Hall". Archived from the original on 2014-01-10. Retrieved 30 September 2013. ^ "Fire of 1922: every student's worst nightmare come true". Archived from the original on 2014-01-10. Retrieved 30 September 2013. ^ "Safford Hall". Archived from the original on 2014-01-10. Retrieved 30 September 2013. ^ a b "Torrey Hall". Archived from the original on 2014-01-10. Retrieved 30 September 2013. ^ "Wilder Hall". Archived from the original on 2014-01-10. Retrieved 30 September 2013. ^ "The Consortium". Five College Consortium. Archived from the original on 2018-10-30. Retrieved 2018-11-06. ^ "Institutions Archive". Consortium of Liberal Arts Colleges. Archived from the original on 2018-11-06. Retrieved 2018-11-06. ^ "Member Institutions". The Annapolis Group of Liberal Arts Colleges. Archived from the original on 2018-09-16. Retrieved 2018-11-06. ^ "Oberlin Group Institution Members". The Oberlin Group of Libraries. Archived from the original on 2018-11-07. Retrieved 2018-11-06. ^ "Consortium on Financing Higher Education". Massachusetts Institute of Technology. Archived from the original on 2018-06-21. Retrieved 2018-11-06. ^ "About". WMHC 91.5FM. Archived from the original on 2008-07-06. Retrieved 2008-06-19. ^ "Facts". mtholyoke.edu. Archived from the original on 2006-08-31. Retrieved 2006-09-01. ^ Lewin, Tamar (2008-06-03). "'Sisters' Colleges See a Bounty in the Middle East". The New York Times. ISSN 0362-4331. Archived from the original on 2018-02-26. Retrieved 2018-03-14. ^ Mount Holyoke College. "Org Directory :: Student Programs :: Mount Holyoke College". Mtholyoke.edu. Archived from the original on 2004-08-11. Retrieved 2011-02-20. ^ "Kudos:Recognition for Dartmouth faculty, staff, and students". dartmouth.edu. Archived from the original on 2007-12-22. Retrieved 2006-12-10. ^ "Photo Gallery | Mount Holyoke College". Mtholyoke.edu. Archived from the original on 2011-06-06. Retrieved 2012-07-14. ^ "Heading for the Hills on Mountain Day: It's Been a Mount Holyoke Tradition Since 1838". mtholyoke.edu. Archived from the original on 2006-03-04. Retrieved 2006-09-01. ^ College, Mount Holyoke (2017-11-20). "An enchanting, entrancing tradition". Retrieved 2018-01-29. ^ "Traditions: M & Cs (milk and crackers)". mtholyoke.edu. Archived from the original on 2006-09-01. Retrieved 2006-09-16. ^ "About the M&Cs". Mtholyoke.edu. Archived from the original on 2012-10-13. Retrieved 2012-07-14. ^ "Traditions: Founder's Day". Mtholyoke.edu. Archived from the original on 2011-06-06. Retrieved 2011-02-20. ^ "100 Years of Laurel and Other Commencement Customs". mtholyoke.edu. Archived from the original on 2006-03-04. Retrieved 2006-09-01. ^ "Mount Holyoke College Athletics Overview - Mount Holyoke". www.mtholyoke.edu. Archived from the original on 2010-08-11. Retrieved 2016-09-03. ^ "Mount Holyoke Athletics : Mount Holyoke Athletics Facilities". Mtholyoke.edu. Archived from the original on 2010-08-12. Retrieved 2012-07-14. ^ College, Mount Holyoke. "A very Mount Holyoke move-in day". Retrieved 2018-11-02. ^ Landis, John (2003-08-29). "Live from the Headlines - Interview with John Landis". Live from the Headlines (Interview). Interviewed by Soledad O'Brien. CNN. Archived from the original on 2007-03-11. ^ "The Seven Sisters". Archived from the original on 2016-08-14. ^ "Mt. Holyoke". Wikisimpsons. Archived from the original on 2018-10-27. Retrieved 2018-10-27. ^ "Milestones 2009". Mount Holyoke College. 2012-04-18. Retrieved 2018-11-03. ^ Gelman,, Judy; Zheutlin, Peter (2011). The Unofficial Mad Men Cookbook: Inside the Kitchens, Bars, and Restaurants of Mad Men. BenBella Books, Inc. p. 201. ISBN 1936661403. Turpin, Andrea L (2010). "The Ideological Origins of the Women's College: Religion, Class, and Curriculum in the Educational Visions of Catharine Beecher and Mary Lyon". History of Education Quarterly. 50: 133–58. doi:10.1111/j.1748-5959.2010.00257.x. Wikimedia Commons has media related to Mount Holyoke College. "Mount Holyoke College" . Encyclopedia Americana. 1920.